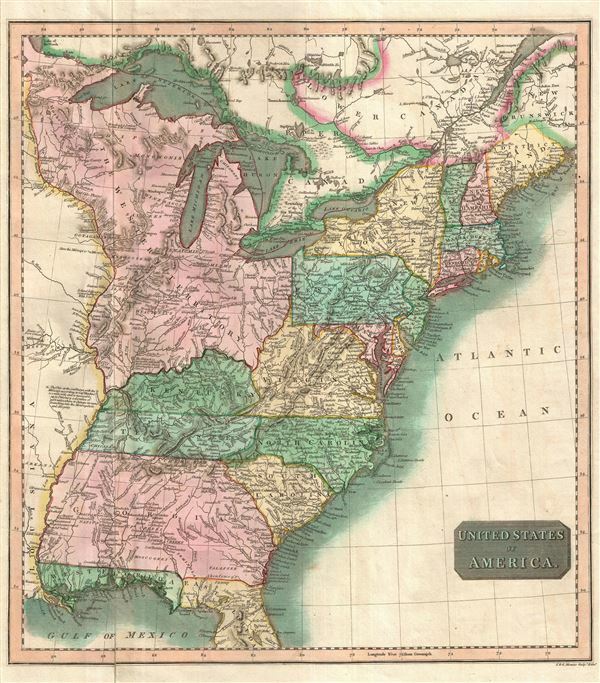 A particularly bright and beautiful example of John Thomson's important 1814 map of the United States. The map focuses on the United States from the Mississippi River eastward to the Atlantic including the Great Lakes and adjacent parts of Ontario, Quebec, and Louisiana. The map shows an early statehood configuration with Georgia extending westward as far as the Mississippi including all of modern day Alabama, Florida divided into eastern and western zones, and the Great Lakes region controlled by the Northwest Ordinance. Florida is depicted according to an ephemeral division into eastern and western zones. This configuration emerged around 1810 when President James Madison annexed western Florida from Spain claiming it as part of the Louisiana Purchase. Though somewhat spurious, Madison's claim allowed the United States to take control of Mobile Bay thus opening an important artery into the interior of modern day Alabama to America traders and settlers. East Florida was, at this time, still under Spanish control and would remain so until the Adams-Onis Treaty of 1821. All of the territory between the Ohio River, the Great Lakes, and the Mississippi is rendered as the Northwest Territory. The Northwest Territory was created in 1789 by the Northwest Ordinance. The Ordinance, which some call the Freedom Act, is considered to be the single most important act of legislation passed by the Continental Congress after the Declaration of Independence. Through the Northwest Territory, the Continental Congress established the conventions upon which the United States would expand westward. By consolidating sole distribution rights for all westward land sales into the hands of the federal government, the Congress established a president that would in the course of the next 50 years, weaken the power of the individual states while simultaneously strengthening the centralized federal government. In what would become Ohio, there is an unusual boundary line labeled 'Boundary Line by the Treaty of 1795.' This refers to the Treaty of Greenville. On August 20, 1794, an American army commanded by Anthony Wayne defeated a Native American force led by Blue Jacket of the Shawnee at the Battle of Fallen Timbers. The treaty that followed established United States hegemony over the region, forcing the American Indian nations to relinquish all claims to land south and east of a boundary that began roughly at the mouth of the Cuyahoga River, then turned southward to Fort Laurens, and then westward to Fort Loramie and Fort Recovery, then finally southward to the Ohio River. The whites, in turn, relinquished claims to the territory north and west of the line. This was a short lived concession and rarely appears on maps. Throughout this map, considerable attention is given to the naming of veracious American Indian Nations, including the Muscogee, Creek, Choctaw, Chippewa, Miami, Illinois, and others. There are several notations along the Mississippi and Ohio commenting the practicality of navigation and trade along the rivers. This is the first edition of Thomson's map from the 1814 edition of the General Atlas. Subsequent editions were published in 1817 and 1826. Very good. Lower left quadrant exhibits minor wear and verso repair. Rumsey 1007.061 (1817 edition). Newberry Library: Ayer 135 T4 1817 no. 55.